A family or an individual’s history is often referred to as their heritage. And that heritage is often epitomized by the heirloom objects that reflect a passion, hobby, career, or a family’s accomplishments. The longevity of the heirloom objects someone wishes to preserve and then pass on as part of their heritage depends heavily on the quality and design that goes into custom framing used to display them. For example, a high-quality framed guidon exemplifying a distinguished military career, or a change of command, demands quality picture framing components. Any picture framer can place a guidon into a frame with mediocre designs, believing it is acceptable. We defer that mentality to the big box frame shops and to the many small “economy” frame shops and online framers who lack creativity, or the genuine concern for the longevity of the objects framed. Many “economy” frame shops believe selling a cheap frame job is their ticket to success. Unfortunately, their ticket to success comes with a short lifespan for their customers’ objects, documents, photographs, and other irreplaceable mementos. Cheap Is The Kiss Of Death For Framed Objects! A cheap (economy) framing price usually reflects a cheaply built product with poor designs, using sub-standard picture framing components. Sub-standard framing components will result in objects fading or subjecting the framed objects to acid damage. Often objects will fade in as quickly as 1-5 years after they are framed with sub-standard materials and non-conservation framing techniques. We look beyond the short term in favor of protecting heirloom objects that reflect the heritage in a conservation quality frame. This technique of conservation framing ensures the custom frame will be preserved and passed on for future generations to enjoy and appreciate. We differ dramatically in a number of ways from our “economy” competitors. First, our framed guidon designs utilize real wood moulding profiles—not cheap plastic or composites. 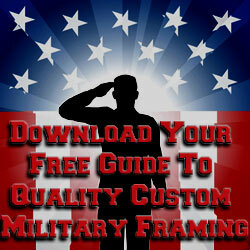 The selected frame profiles illustrated on this website are effective for showcasing framed guidons with military objects. This selection of frames has proven itself from years of framing experience. Our framed guidon designs have worked extremely well since the inception of our retail storefront in 2006. Because these profiles have sustained their popularity for guidons and military framing projects, we consider them to be timeless. More importantly, because they are timeless, they are not a dated “fad design” or a frame that will fall out of favor with future generations. Utilizing frame styles that stand the test of time is part of the overall military and civilian framing philosophy we employ. In addition to the timeless nature of our designs, every framing project we produce incorporates conservation framing materials. 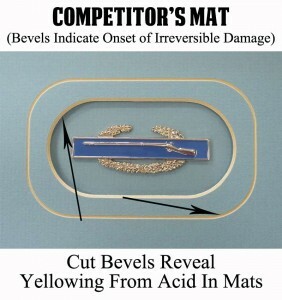 This means the mats will not impart acid burns onto your objects, fade, or turn brown on the cut beveled edge. 99% UV protected glass or acrylic is an essential component that provides protection against fading and aging inside the frame. For this reason, every project we frame includes 99% UV protected glass or acrylic. We don’t even stock plain glass! The mats, tape, backing, hinges, spacers, and foamboard are acid-free. 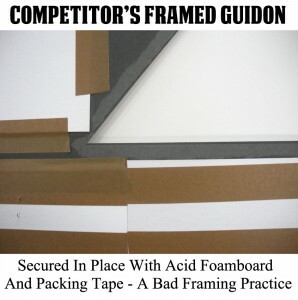 We seal the inside frame rabbet with protective archival acid-free framer’s tape to protect against off-gassing. Utilizing acid-free components eliminates concerns about acid burns to cherished military objects, awards, certificates, photos, and mementos. Acid-free glass spacers are utilized to separate objects from the glazing. This conservation procedure prevents the objects from touching the glazing. By eliminating an object’s contact with the glazing, we prevent possible breakage or scratching. A time-consuming and painstaking part of the guidon framing process involves securing the guidon and surrounding objects in place. This part of the framing process fundamentally separates us from our competitors. Many of the “economy” or “cheap” frames produced in brick and mortar shops and by online framers do not include adequately securing the guidon and heirloom objects in place. The major difference between us and them involves the time and effort required to securely position every item in place. An example of an improper, non-conservation method of attaching a guidon inside a frame. 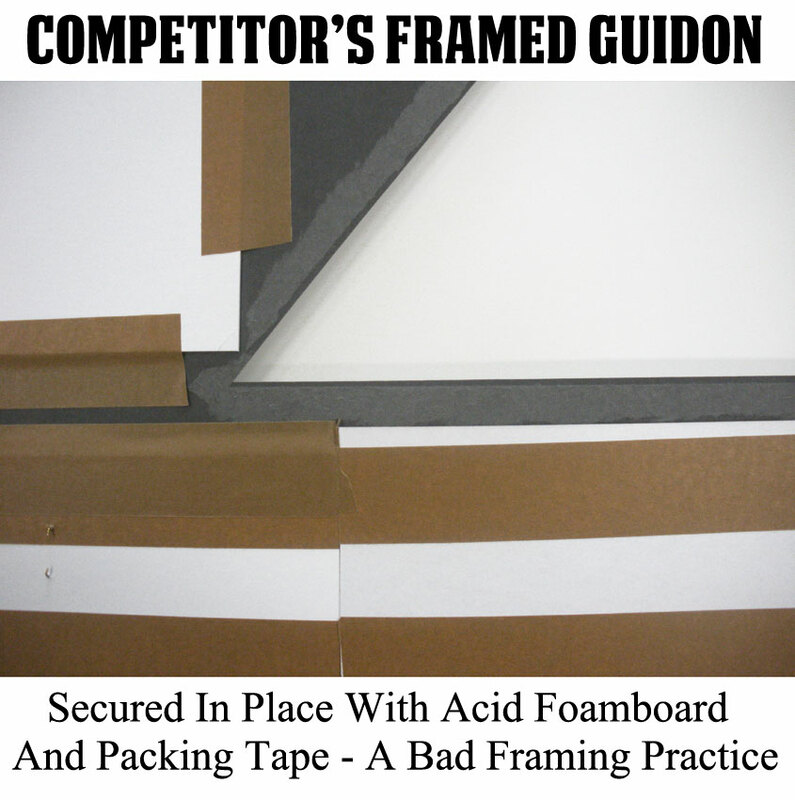 We know the methods used by our competitors for attaching guidons inside a frame because we have repaired their work! For example, we have seen guidons that were attached using spray adhesive. Time and heat have a tendency to cause the guidon to release, sag, or fall. Although this is an economical method for attaching the guidon, we contend that we offer a better way to ensure against the guidon releasing, falling, or sagging by sewing it securely in place. Perhaps the worse guidon attachment methods used by a lot of cheap framers involves using cheap acid double sided tape and or cellophane packing tape to attach guidons to an acid based foamboard. There are three major problems associated with this non-conservation framing practice. First, the use of acid mats is taboo for preservation and conservation purposes! 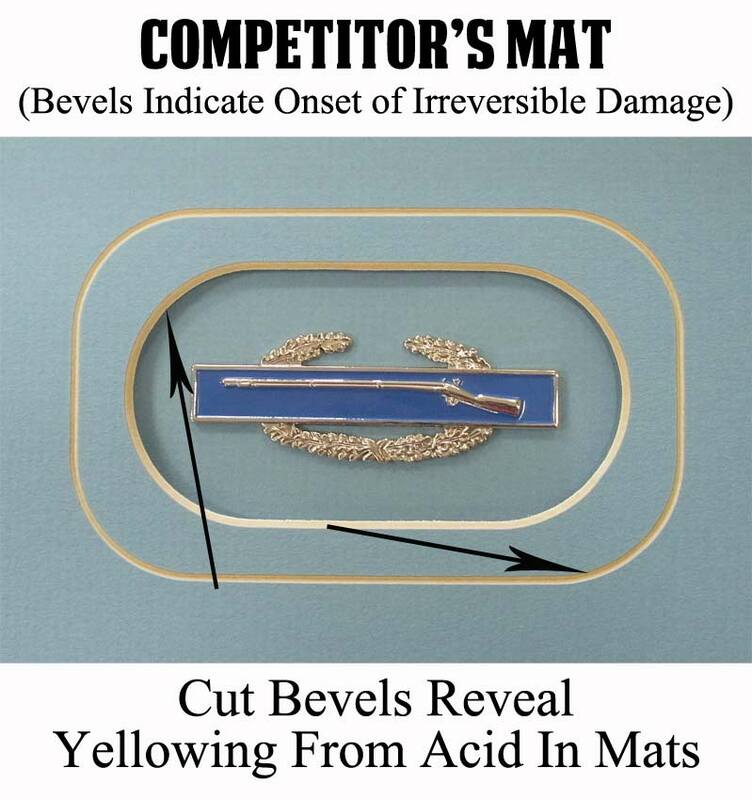 The acid mats will ruin the objects inside the frame. We have addressed this fact earlier that cheap acid mats will cause acid burn damage to objects inside the frame. The second problem is that cheap tapes will off-gas. Off-gassing inside the frame is a contributing factor to acid burns. The third problem associated with using cheap tapes is the guidon attachment is not permanent. Cellophane and double sided tapes become brittle with time when subjected to heat and cold extremes. Packing tape and double sided tapes were never designed to hold something in place for 10, 20, or more years. So why should you pay to have your guidon secured with it? Because it is a cheaper alternative to doing it right? We Secure Guidons In Place The Right Way! 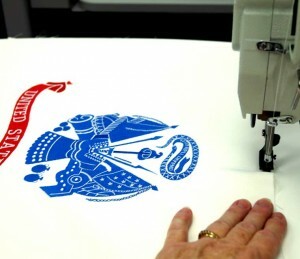 The key to properly securing a flag or guidon in place is to sew it onto an acid-free mat. All of our guidons are ironed flat and smooth, and then sewn with a commercial sewing machine onto an acid-free matboard. This procedure takes longer and adds a little more to the overall expense. However, the completed project commands respect from the crisp and taut manner in which the guidon is permanently attached for display. The framed guidon will hang with the same rigidly thirty years from now, as it did the day it was framed. Using this method prevents the guidon from releasing, sagging, and falling. As a side note: Our customers have shared with us embarrassing situations where guidons improperly fastened in place have fallen during the presentation ceremony. The only way to avoid this embarrassing situation is to insist that your guidon is sewn in place with acid-free materials—not sprayed or taped in place. Tape was designed for the mailroom, not guidon displays! If a guidon can’t be attached right, don’t waste money on something that won’t last! Often we are presented with framed objects and heirloom pieces that were framed by a competing “economy” or big box framer, which lack balance or design symmetry. Nothing looks worse than a lop-sided design that is out of balance with objects disproportionately spaced inside the mats. We spend time measuring and designing framing projects on a computerized mat cutter. The design process makes sure the objects framed are balanced and aesthetically pleasing. We also create designs that eliminate “dead space” in the frame. Superior designs are accomplished by asking our customers a few questions about the objects and the historical significance of what they intend to have the objects represent. If the customer is in our shop, we will show them the design on the mat cutter’s computer monitor. If the customer is not in the shop, we will email them the design images from the computer for them to review and approve. The process of asking questions and showing designs often inspires suggestions for the inclusion of additional objects inside the frame to tell a more effective story. Working with our customers helps define in a definitive way their vision for framing. The collaboration with our customers also enhances the symmetry when additional objects are added for balance or to eliminate dead space. Depending on the frame size and the need to eliminate dead space we will add additional openings at no extra charge, provided the dimensions of the frame do not increase. 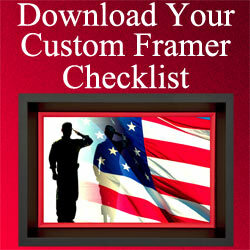 The overall result produces an attractive, well-balanced framing project customers are proud to display. FramedGuidons.com is a division of Cindy’s Custom Framing & Antique Art. Our frame shop is located in Richmond Hill, GA. Richmond Hill is home to a large number of retired military personnel and active duty soldiers at Fort Stewart and Hunter Army Airfield. Our frame shop is also accessible via I-95 to Kings Bay Naval Station and the following South Carolina military facilities; Coast Guard Base Charleston, Joint Base Charleston, Marine Corps Air Station, Beaufort. Over the years, we have developed a bond with our military and civilian customers. We view our retired and active duty military personnel with respect and honor. A significant attitude towards custom framing separates us from many online, and brick and mortar picture framers. While it’s true we need to make a profit framing, we don’t view our customers with dollar signs in our eyes when they come through the doors, or when they place an order online with us. It is for this reason, we offer our customers both in person and online a unique personal customer experience. The first step we take to achieve a great design is to involve our customers in the design process. We listen to our customers as they explain the significance of the framed project. As mentioned above, we show our customers various designs. Spending time with our customers is an important consideration and part of the discovery process, where we learn about their framing objectives. Instead of viewing our customers as a one-time quick frame job, we view them as a partner in the design process. By partnering up with our customers, we are assuring them we have their best interest at heart—helping them preserve their heirlooms as part of their heritage. This partnership is intended to assure our customers that we will respectfully produce a completed project they will proudly display and pass on to future generations. We do a lot of framing for change of commands, PCS presentations, parting gifts, military retirement ceremonies, retirees who want shadowboxes and guidons framed, and for various awards that are presented. In our custom framing operation, we do not take a cookie-cutter approach to designing a custom frame or shadowbox. For example, framing guidons for a change of command involves asking questions and making suggestions. The objective is to include mementos and objects which reveal the character and accomplishments of the departing commander. Our intention is to reflect the pride felt by the men and women who served under the commander. We also want to do this in a respectful and meaningful way, so the departing commander knows they were respected, appreciated, and remembered by their former troops. Often, it is the little things that people don’t see that can prevent expensive mishaps from occurring. Over the years, we have repaired a lot of damaged framed projects after they fell and broke! Poor quality hangers costing only a few cents is often the culprit! For this reason, no eye hooks are ever used in the construction of our framed guidons or framed projects! We utilize sturdy metal hangers and plastic coated wire matched to the weight of the framed piece. Collectively, these two framing components are designed to provide a secure means for hanging a framed object, and preventing a costly mishap that could damage irreplaceable objects. The back of the frame also has an acid-free dust cover that will not stain the wall or allow for off-gassing inside the frame. Off-gassing inside the frame will contribute to shorting the life of the framed project. Finally, the back of the frame contains rubber bumpons designed to keep the frame from damaging the wall. This is an example of our most popular frame and design for the Aviation 28” x 20” Guidon. 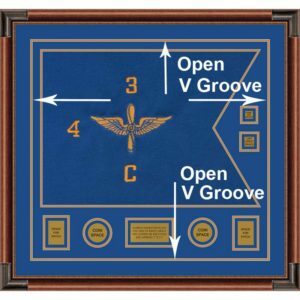 This framed Army Aviation guidon features the open V-groove. 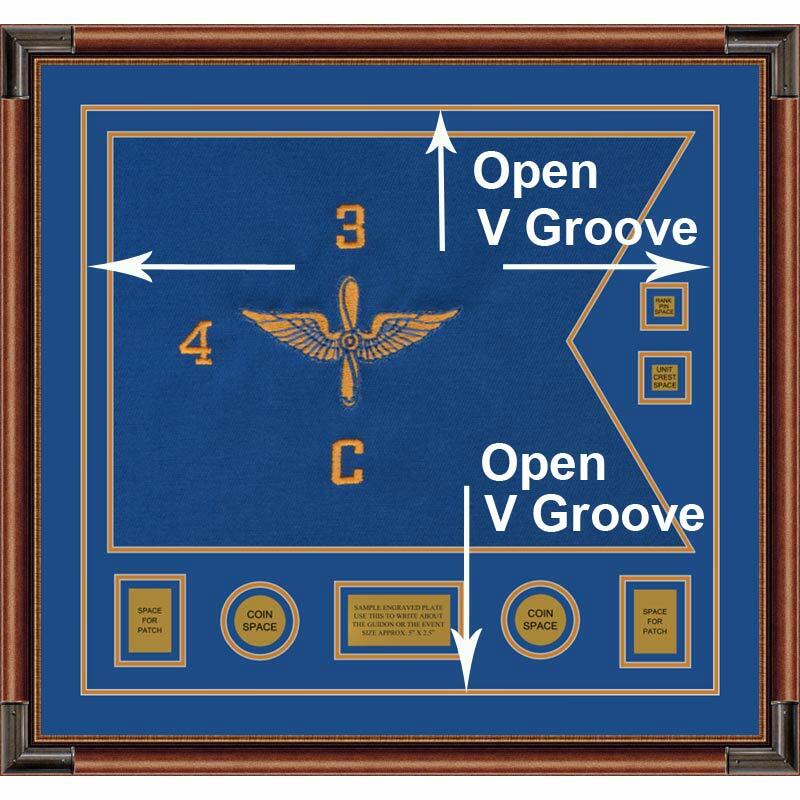 The signature design element that goes into every military custom framing project we complete is an open V-groove. The “open V-Groove” is much wider than the standard bevel cut V-groove most picture framers offer. Essentially, the open V-groove is a set of mats surrounding an interior series of mats. The interior mats surround the objects and the guidon. The exterior set of mats extends out from the interior set to the edge of the frame. Using the open V-grove adds depth and dimension. The open V-groove also serves to focus your attention towards the objects inside the frame. Not any picture framer can produce an open V-groove. It is generally not attempted by other picture framers because of the difficulty in setting up the design, cutting the mats, and then assembling the series of mats inside the frame. We have perfected the procedure for making the open V-grooves. The open V-groove is incorporated into our framed guidon designs. Our military customers highly favor this design element. They consider a frame job without the open V-groove as “bland” and unacceptable. For this reason, the open V-groove is included in all of the pre-designed guidon options offered in the e-commerce section. Framing for the military has honed our skills at providing designs that work well for framed military objects, mementos, and framed guidons. The standard framed guidons on this site in the e-commerce section are broken down into four sizes. These four sizes are for a 7”W x 5” H guidon, 12”W x 9”H guidon, 20”W x 15”H guidon, and a 28”W x 20”H guidon. Each guidon size is broken down into three designs. Each of the three guidon designs offers different objects with a nameplate and guidon. There are four name plate designs to select from. In addition, there are three frame moulding profiles for each guidon size that can be selected. 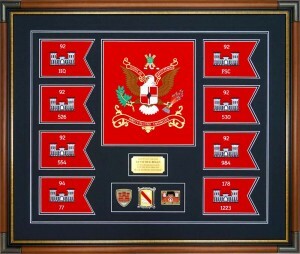 This means there are 144 possible framing choices for any guidon, for example, Signal Corps. To simply matters, we have assembled the most popular designs in order to expedite the e-commerce experience for our customers. If none of the framed guidon sections meet your design requirements, we are more than happy to offer custom framing options to satisfy your framing needs. 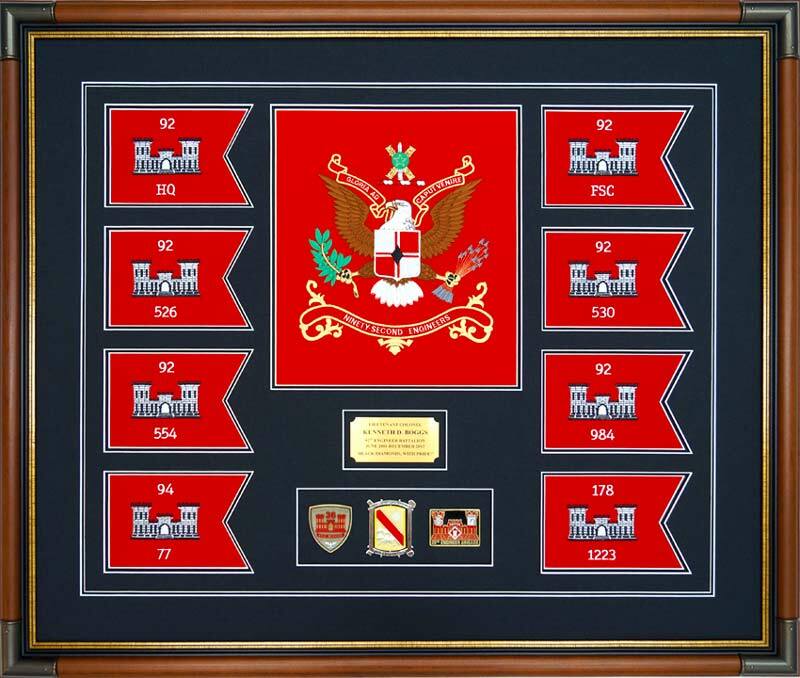 Some of the custom framing options we are able to design include different combinations of patches, insignia, medals, awards, photographs, even knives, spurs, and military souvenirs. We offer custom printing for our clients who wish to have photos included in the project. The printing is done in-house for a nominal fee. Often we make Photoshop corrections at no charge to make sure the photograph is suited for framing. The photographs are printed using archival inks and acid-free papers—designed to last decades. As we said, the e-commerce section is developed for convenience. If none of the designs in the e-commerce section is suited to your taste, we will gladly discuss other framing options. Some of these options may include using different colored mats, including different objects other than what is suggested. Framing is about our customers—not restricting them to cookie cutter designs like most of the frame shops on the internet. Our completed projects gallery contains a number of finished military projects. We encourage you to view them if the standard designs do not suit your requirements. Contact us at 912-756-2781 or by email at sales@framedguidons.com and we will begin the custom design process to ensure your satisfaction. Is Quality Worth The Price? We admit that the use of high-quality products raises the price of the finished product. But in the scheme of life, some objects and mementos in a framing project are irreplaceable. So how do you put a value on them? We have seen poor picture framing practices result in original document signatures fading into obscurity, by going from dark black to light brown. Richly colored mats have faded into muted hues from their original color. We have seen acid burns destroy the value of original art and limited edition prints. We have seen the irreversible fading damage caused to art, documents, photographs, and momentous by using plain glass because it was a few dollars cheaper! We have seen coins and objects fall inside the frame because they were not secured properly. We have seen rust stains on cloth objects because picture framers have pinned cloth objects in place with nickel plated pins or even with staples! As mentioned before, we have repaired competitors’ guidons that were secured in place with cheap packing tape or double sided acid tape. Our customers want to see their objects in the same condition years from now, as they were when they brought them to us for framing. The only way that can be done is to frame them right, using conservation framing procedures—not cheaping out with the expectation that it can be framed for almost nothing. is shipping & insurance free to the lower 48 states? If your framer can not provide the elements listed above as part of the framing package, there is a strong possibility you are over-paying for what you are getting—even for the “cheap” frame job. If you have any questions about comparative framing prices or services, please feel free to contact us and we will spend time with you explaining the benefits of framing that utilizes our conservation quality techniques. The greatest proof that our designs, components, and pricing works effectively is by the number of repeat orders we get from our customers and our customers’ friends and families. Customers who frame with us and who give framed guidons as gifts, are proud to tell us their gift was hung proudly, instead of being hidden away in the closet, put under the bed or stored in the garage. The Honor of Framing Guidons Is Truly Ours! The greatest honor we have bestowed upon us from our military customers has occurred during presentation ceremonies. On numerous occasions when our framed guidons, military shadow boxes, and framed awards have been presented, the recipients have nodded their acceptance and teared up! Our frame jobs have brought battle-hardened veteran commanders, officers, non-commissioned officers, and enlisted men to tears as they reflect on the significance of what the framed guidons represent and the achievements behind the objects surrounding the guidon. To these wonderful men and women, you are our heroes! We have enormous respect for you and what you have accomplished to honor America and keep us free. Thank you and God bless you. Finally, our last word about our framing practices. Our designs and high-quality framing practices have given us a great reputation for providing the best designs at a very reasonable price. We don’t frame for the short-term. Our framing designs are intended to give our customers a lifetime of quality and the ability to pass on to their next generation the mementos and objects they hold dear to their heart. Part of a person’s heritage is passing on important considerations about a lifetime of work and achievements. People are remembered by the physical objects they display and leave behind. We offer the ability to pass on a heritage in the form of custom framing, utilizing objects and mementos that reflect a person’s life or career. If you have any questions about designs, custom framing options, pricing, or package substitutions, please feel free to contact us either by email at sales@framedguidons.com or by phone at 912-756-2781 and we will gladly spend time with you.